Washington State & 4-H Scholarship Information ~ Washington State 4-H is pleased to offer a number of different scholarships. Current and former Washington State 4-H members are eligible to apply. Applicants must have accumulated at least two years of 4-H affiliation. Previous Washington State 4-H scholarship recipients are not eligible to apply. Applicants must be a senior attending an accredited two or four-year college or university in the fall. Scholarship application opens January 1st. Deadline to apply is March 15 at 9:59 pm. Application process is through 4HOnline (see the right hand column on the link here). Alexander Hamilton Scholars – The Hamilton Award recognizes young people for their academic, personal, service and entrepreneurial accomplishments, and 35-40 students are selected annually to participate in the Alexander Hamilton Scholars (AHS) leadership program. Our winners are high-achieving, service-focused high school juniors with grit, perseverance, and demonstrated need. All applicants should be college-bound, and committed to participating in our rigorous leadership program. Applications for 2019 award open November 12, 2018 through January 30, 2019. Washington State Sheep Producers – Deadline is May 1st. Get a copy of the application here. 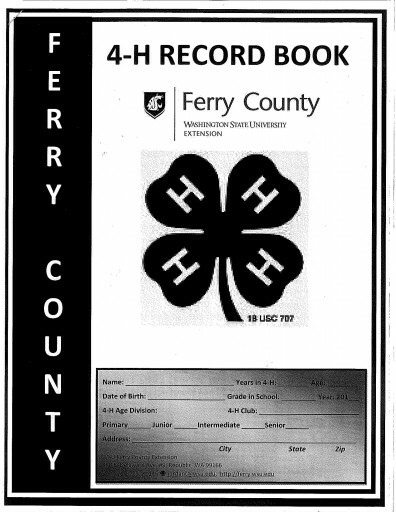 Stop by the 4-H office to pick up your free copy of the Ferry County 4-H Record Book. Record Books are not a Ferry County 4-H requirement however it may be a club requirement. All 4-H members are strongly encouraged to keep a record book. Save your book for future reference when you are in high school and need scholarship(s) or job reference materials. Or use it to look back on fond memories of your 4-H years! We recommend getting a 3-ring binder and dividing each section of your book. Remember, it is OK to leave some spaces blank. Not every member does everything. It is important to be accurate, clear and complete on the project records you do have. The Ferry County record book is fillable online including the extra project sheets. Although a typed record book is always neat, don’t forget to include the personal touch with coloring and handwritten notes. Also, the work must be done by the 4-H’er! This is not a Ferry County 4-H requirement, but most clubs require their members to complete one educational poster per 4-H project. A good educational poster should be a simple design, easy to read from a distance, show creativity and most importantly convey educational value. Interactive posters are encouraged! The 4-H office does not laminate posters for the Ferry County Fair. If your blue ribbon poster is state fair bound, 4-H members can call the office to schedule a time if you would like your poster laminated.